Dunkin' Donuts introduces new Frozen Dunkin' Coffee as a permanent addition to their coffee drinks lineup at participating locations nationwide. The new drink features "a special extract featuring 100% Arabica coffee to bring forward the signature flavor of the brand’s premium coffee, blended with ice and dairy." It can be customized with any Dunkin' Donuts flavor swirl or flavor shot as well as your choice of dairy (cream, whole milk, or skim milk). 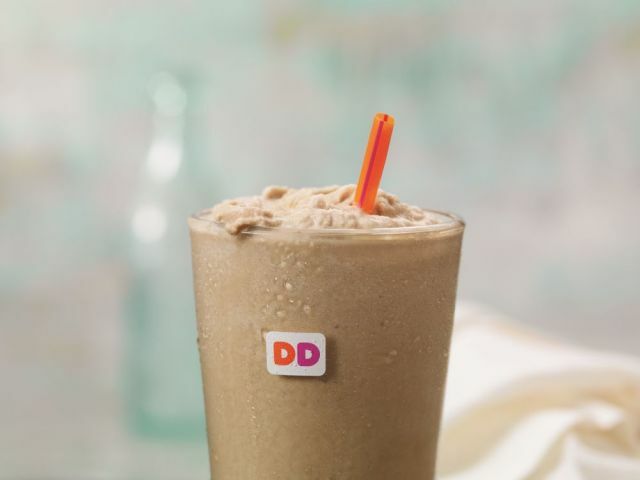 Dunkin' previously offered the Frozen Coffee Coolatta, which the new drink replaces. The Frozen Coffee Coolatta was a coffee and mocha-flavored slush drink that contained little in the way of caffeine. The new drink promises more of a buzz and is more true to the brand's Original Blend coffee. To celebrate the launch, Dunkin' Donuts will be holidng a national tasting event on Friday, May 19, 2017, from 10 AM to 2 PM, where anyone can pick up a complimentary sample (3.5 ounce) of Frozen Dunkin’ Coffee, while supplies last.